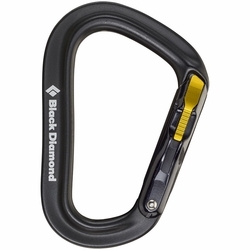 Black Diamond Vaporlock Carabiner. Black Diamond's light and versatile patented pear-shaped locking biner with the security and ease-of-use of their innovative Magnetron Technology, the Magnetron VaporLock is ideal for long free routes. BD's lightest pear-shaped locking biner, outfitted with our innovative Magnetron Technology, the Black Diamond Magnetron VaporLock is the ultimate lightweight locker for long free climbs and shaving grams off of your rack. Magnetron Technology uses a steel insert in the nose of the carabiner and two magnetic arms in the gate for a super-secure, super-fast and easy-to-use locking mechanism.